When it is full-on winter outside, people’s brains go into overdrive dreaming of warm, tropical places and summertime. My feed is filled with pictures of bare feet on beaches, palm trees, swimming pools in sunny locales. It’s not something I can honestly relate to, but I understand that this is what my friends desire. Jeremy and I? We love to frolick in snow. 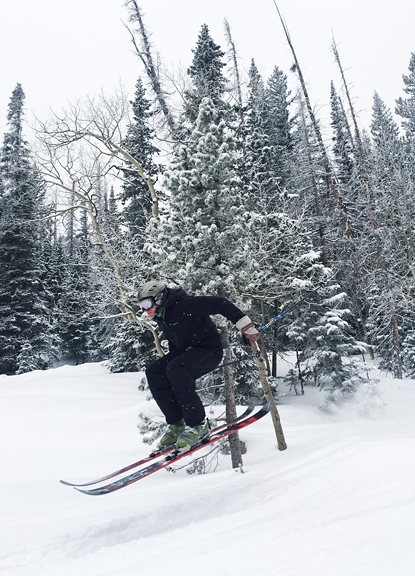 It is what we talk about with longing during the throes of summer – how much we miss gliding over and through the snow, or feeling the delicate kiss of blower powder on our faces. From what I can tell, Neva loves winter even more than summer. 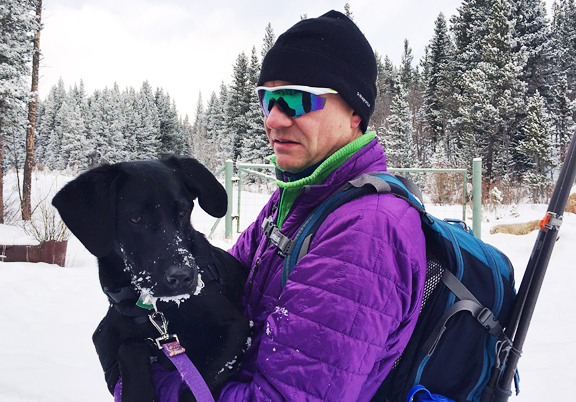 She spent all of 8+ miles running her face through the snow on Saturday’s ski tour. 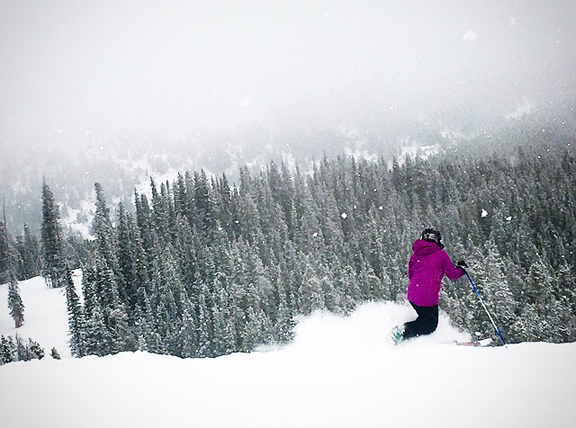 It’s as if those bazillion little snowflakes give her an extra jolt of energy. Jeremy noted that she calmed down a tad after the first 6 miles, but even as we got back to the car, she was alert and ready for more action. Of course, once home, she passed out for a long and happy nap in the sun. Such is the life of a happy pup. More than a month had passed since my last ski tour with Erin, so we took the opportunity to catch up with one another on the climb. We discussed “Making a Murderer”, family visits, and new locations to scout for porcini, chanterelles, and huckleberries this summer. I told her that I had dreamt of chanterelles one night over the holidays, and then of foraging huckleberries the following night. 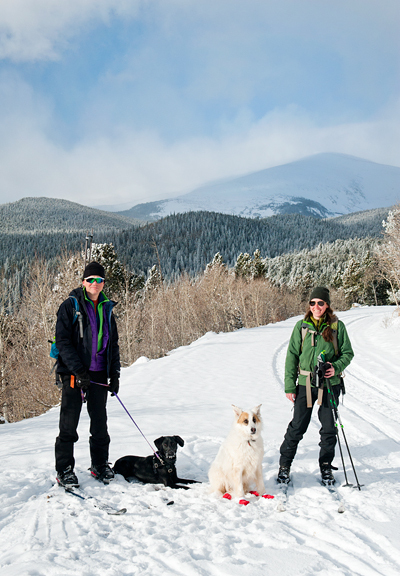 She smiled and nodded as our skis silently sliced through the soft white fluff underfoot. My obsession with huckleberries is only slightly diminished in their off season. For the other eleven months of the year, I think of different ways to incorporate those nomalicious berries into various recipes (and where else in Colorado I should look for huckleberry patches). 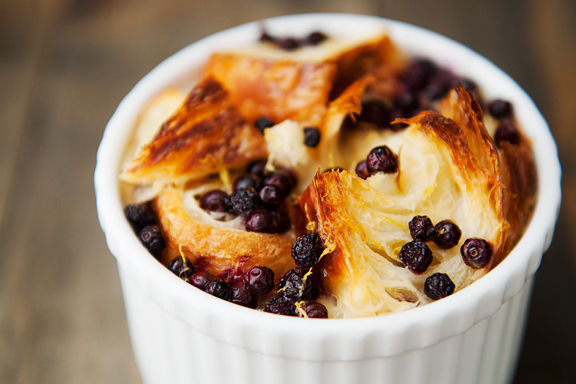 Those of you without access to fresh or frozen huckleberries can easily substitute blueberries, raspeberries, or blackberries in this croissant bread pudding. Any kind of juicy berry should do. But let us be clear… wild Maine blueberries – as delicious as they are – are not huckleberries. I’ve had both and hands down, hucks win. 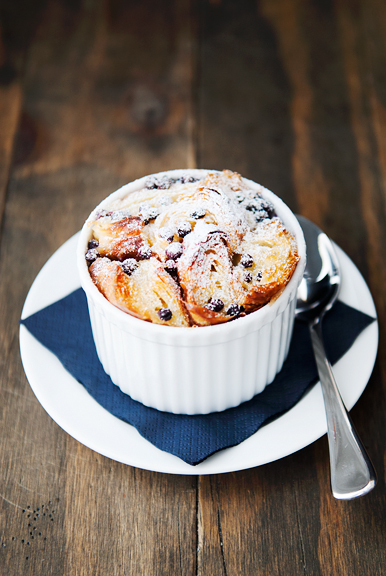 Bread pudding is fairly indulgent as it is, but I like to take it a little further and use buttery breads like brioche, challah, or in this case, croissants. 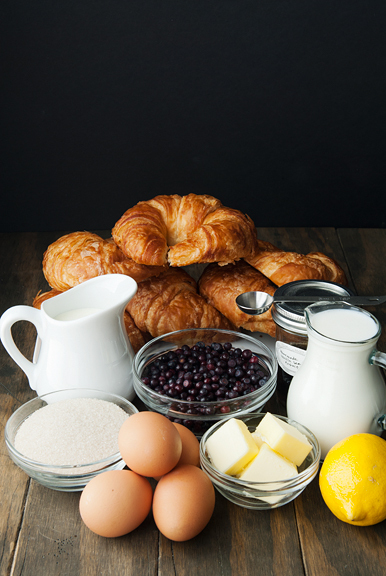 Croissants have the added delightfulness of delicate flaky layers that seem right at home with custard and wild berries. 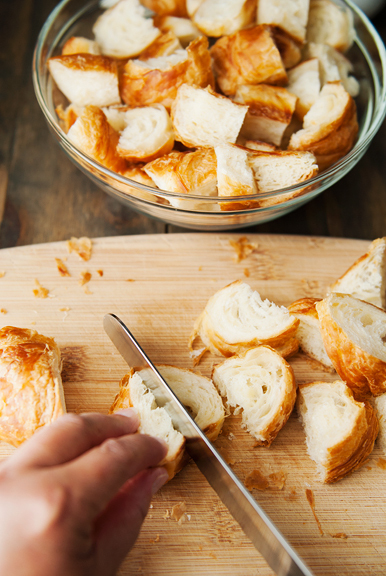 I used about six large croissants – approximately one croissant per 8-ounce ramekin. If you want an easier option, bake it all in a small 8×12-inch baking pan. Both ways taste great, but the individual bread puddings give you more crunchy edges (which I love). 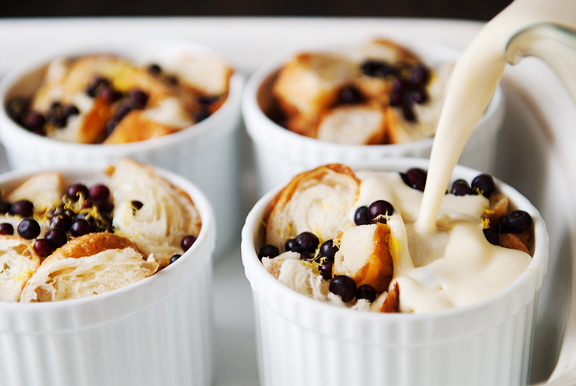 Bread puddings make lovely desserts or fancy breakfasts. You decide if it will be one, the other, or both! With ramekins or a single baking pan, layer half the croissants, berries, and zest, then layer the rest in the same order. Press the bread down a little, as croissants tend to be fluffy little guys. 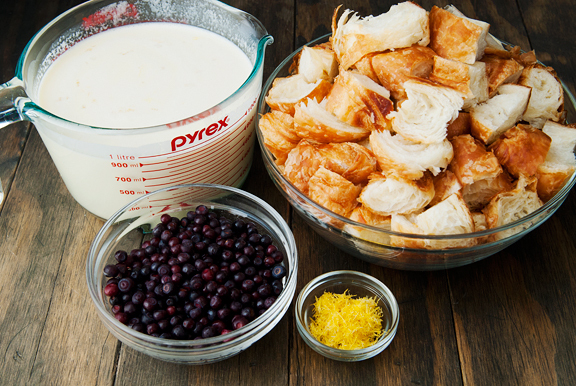 Once filled, pour the custard over the bread and berries, making sure to soak all of the pieces on top. 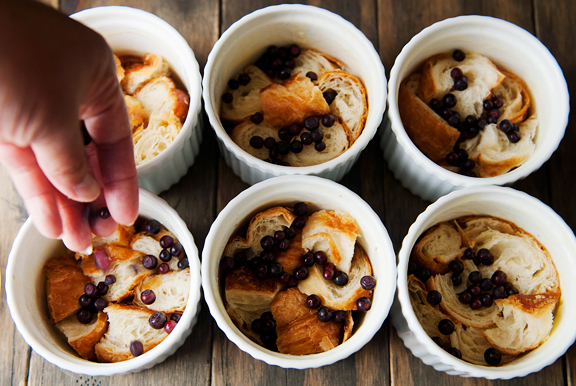 If using ramekins, set them in a boiling water bath in a roasting pan or a large baking dish. Make sure the water comes halfway up the sides of the ramekins, but take care not to spill any of the water into the puddings. What emerges from the oven is a creamy pudding dotted with pleasantly tart berries and topped with a sweet caramelized crust. The puddings will also reheat nicely as the flavors develop and mature with a little time in the refrigerator. A dusting of powdered sugar is all you need to finish it off. Well, that and a spoon. Preheat oven to 350°F. Butter six 8-ounce ramekins or one 8×12-inch baking dish. 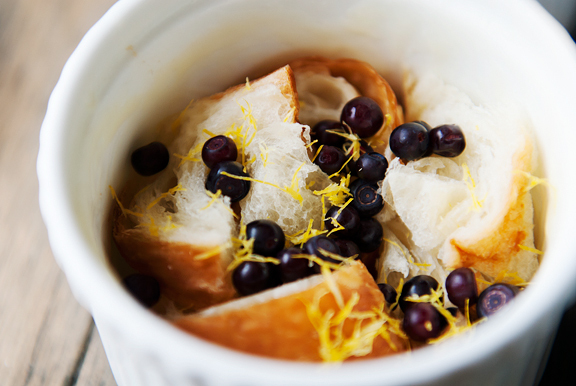 Layer half of the croissants on the bottom, then half of the huckleberries, then half of the lemon zest. Repeat. Press the bread down gently. 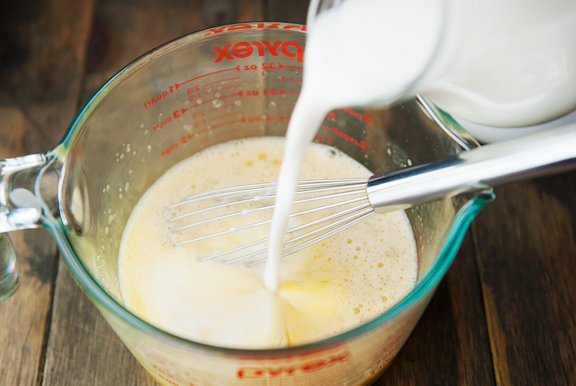 Whisk the eggs, sugar, and vanilla together in a medium bowl or large 4-cup measuring cup. Stir in the cream and milk. 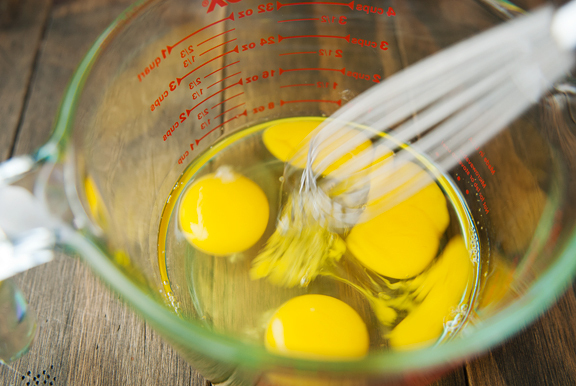 If using ramekins, divvy the egg mixture evenly among the ramekins. 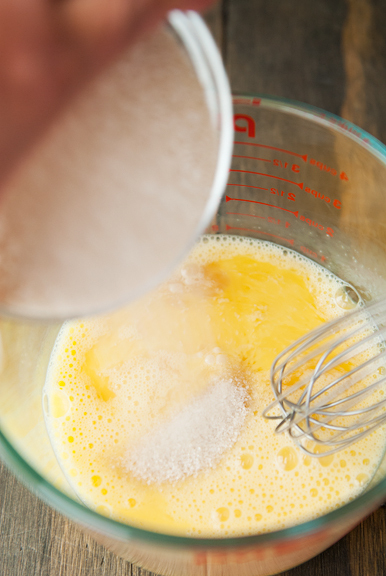 If using a baking dish, evenly distribute the egg mixture over the filling. 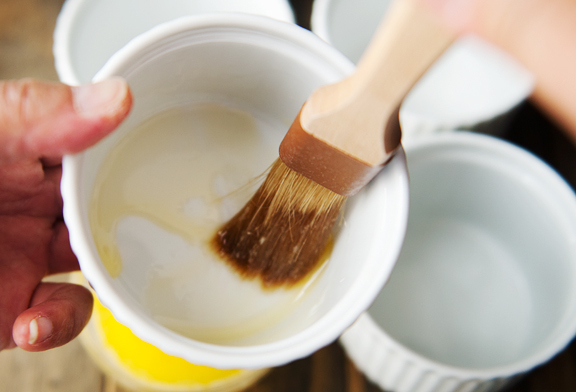 To bake: If using ramekins, bring a kettle of water to a boil. Place the ramekins in a roasting pan and fill the pan with boiling water until the water line is half way up the ramekin sides. Take care not to splash any water into the bread puddings. If using a baking dish, put it straight into the oven. Bake both versions for 30-35 minutes until the custard is set and the tops are golden brown. Remove from oven and dust with powdered sugar. Serves 6. Uuuhhhhh next dimension of bread pudding! Really have to try that one!! Now this has TPH written all over it! I think it looks scrumptious, too! Oh Boy…Nomalicious for sure! I’m off to Moxie right now for some croissants! Okay.mmwill serve this when fam comes over Thursday night. 8 miles!! Inspiring! I was gifted a jar of homemade huckleberry jam for Christmas. Add that to the last jar I’m hoarding from this past summer and the possibilities, oh the possibilities. So nice to see snow pics, it rained here yesterday, complete with thunder and lightning. :( Conditions today will be glacier like. Got the East coast blues. Keep those lovely photos coming, please? Jean – I hope they all enjoy it! Looks so good! 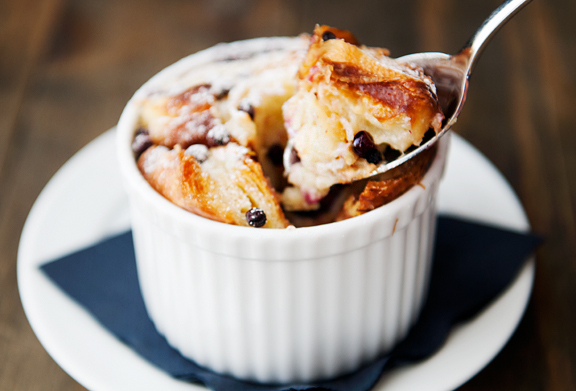 It’s freezing here so a nice warm plate of bread pudding would be divine! Thanks for another great recipe. As always the pictures look amazing. I was wondering can I substitute the huckleberries for something else? (cherries? even chocolate chips?) since the berries aren’t easily accessible. It’s great to see the pup growing up. A happy dog can lift your heart. 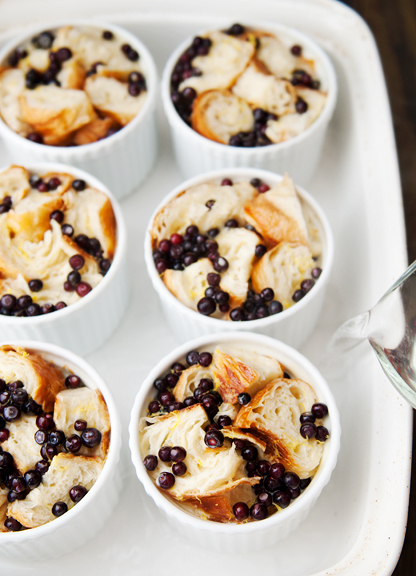 Bread pudding is one of my favorites, and I especially enjoy using (leftover) pastry to put it together. Croissants are delicious, and fruit danish or cinnamon rolls are good choices, too. Anna – yes, you can sub anything, really – but a juicy berry like a blueberry, raspberry, blackberry will work best. These look soo good!! I’m going to have to try them with some blueberries!